Since I am dressed head to toe in orange today, that can only mean one thing .... IT'S FOOTBALL TIME IN TENNESSEE !! The University of Tennessee will wrap up it's 2009 season tonight in the Chick-Fil-A Bowl in Atlanta, GA against Virginia Tech. Game time is 7:30 PM EST. It will be broadcast live on ESPN. According to PR Newswire (click here to read), the 2010 Rose Parade will have a Donate Life float on New Years Day. The theme of the float will be "New Life Rises." The float will feature photos of 77 organ and tissue donors from across the U.S. and will be ridden by some of the recipients who received the gift of life from these 77 heroes. I can't think of a better way to start 2010 than by honoring these 77. Here in the Volunteer State, we would refer to them as "The Ultimate Volunteers." "Hey !! What are you doing here ?? This is my spot !!" How about a little humor today. Everyone should enjoy this one. Being an outdoorsman, I've always enjoyed watching wildlife. I've got a spot in my backyard where I put out "treats" for the local critters. I also have a Cuddeback Digital Scouting camera out to keep track of what comes to visit. Usually, I get deer, squirrels, birds, and racoons. Occasionally, I get some really good and sometimes humorous pics like this one with the squirrel and deer. Here, it looks like this doe caught the squirrel eating her breakfast and is asking - "Hey !! What are you doing here ?? This is MY spot !!" I hope everyone had a great Christmas. I know I did. It was my third "extra" Christmas since my transplant. Before Christmas, a friend sent me a link to the article, "A Downside of Organ Donation" (read here), which appeared on the Wall Street Journal's website telling about some of the risks transplant recipients assume due to their transplants. Transplant recipients know we may not survive the surgery, the anti-rejection drugs make us more susceptible to infection, and that the anti-rejection drugs can come with side effects such as high blood pressure, high cholesterol, and decreased kidney function. However, this article tells about some of the other potential problems that may develop if a donor has health issues that go undetected during the routine testing during organ recovery. After reading the article, I believe that we need to develop better testing procedures to at a minimum reduce some of these issues and hopefully one day eliminate them. However, when those additional procedures are developed, we need to make sure they can be conducted quickly but accurately because during an organ recovery time is of the essence. Each recovered organ has a window of time in which the transplant must be completed or the organ is no longer viable. For instance, a heart is only viable for four hours from the time it is clamped off and removed from the donor till the time it is re-started in the chest of the recipient. If it takes any longer, the transplant may not be successful. Each day over 120 Americans are added to the U.S. transplant waiting list and about 19 on that list die waiting for an organ. I could have been one of them. The need for organs for transplant continues to grow so we will have to be careful that any new testing procedures do not negatively effect the number of organs available for transplant. 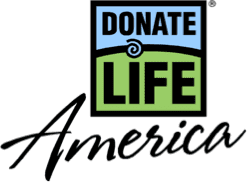 You can help the ones currently waiting by visiting the Donate Life America website by clicking here to learn how to register as an organ and tissue donor. Enjoy a special Christmas card by clicking here. 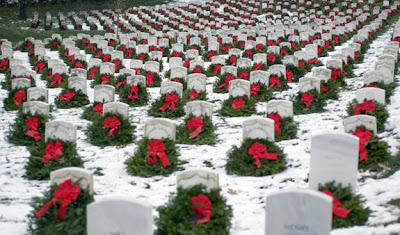 This a picture of Arlington National Cemetery at Christmas. It is a beautiful display of tribute to the ones who have fallen fighting to protect the freedoms we hold dear. Freedoms such as celebrating Christmas, the birthday of our Savior. Many of America's military families will be celebrating their first Christmas without a loved one, a hero, who gave all to protect us. Let us never forget their sacrifice. Let us say a "special thank you" to every man and woman in our military this season. Everyday, we should pray for their safety and for peace and comfort for the families that have given fathers, mothers, sons, daughters, and other family members for us. God Bless them all. ...... to send the ACLU a Christmas card. Yes ... a CHRISTMAS CARD !! They are working so very hard to get rid of the CHRISTMAS part of this holiday, we should all have some fun and send them a nice, CHRISTIAN card to brighten up their dark, sad, little world. Make sure it says "Merry Christmas" on it. Heck, make sure it's got a picture of baby Jesus on it, too. Two tons of Christmas cards would freeze their operations because they wouldn't know if any were regular mail containing contributions. So spend 44 cents and tell the ACLU to leave Christmas alone. Also tell them that there is no such thing as a "Holiday Tree." It's always been called a CHRISTMAS TREE !! For those of you who aren't aware of them, the ACLU (the American Civil Liberties Union), is the one constantly suing the U.S. Government to take God, Christmas or anything Christian away from us. They represent the atheists and others in this war. Help put Christ back in Christmas !! My regular readers have heard me ramble on and on for months concerning health care reform. Today, I'm gonna do something I don't really want to do by telling of my personal experience with socialized medicine - Medicare. Why ?? Because the U.S. Senate is promising a vote on ObamaCare by Christmas, and I want everyone to know what you may get because this plan will be very similar to Medicare. As you read today, forget about all of my previous writing on the issue, all the news reports and rumors of rationing, so-called death panels, and inferior care, and think about one thing only - customer service. Shortly before my heart transplant, I went on disability making me eligible for Medicare. I enrolled in the COBRA plan of my employer when I quit work due to heart disease and stayed on that through July 2008. On August 1, 2008, I went onto a Medicare Advantage Plan administered by Humana. At that time, Humana told me that my anti-rejection medications, Gengraft and Cellcept, would be covered under Medicare Part B. A few months later I went to my pharmacy to pick up a Cellcept refill and was told it was over $600. When I asked why, I was told that I was in the coverage gap a.k.a. the donut hole. I did not understand how that could be. So, when I got home, I called Humana to find out. They told that yes I was in the donut hole because of the high cost of the anti-rejection drugs. However, when meds are covered under Part B, they do not count toward your total annual drug costs, but apparently Humana had put them under Part D so they did count. Therefore, I hit the donut hole pre-maturely leaving me with no drug coverage the rest of the year. I hit the roof and filed an appeal because Humana had not covered the anti-rejections meds the way they told me they would. On November 17, 2008, I received a letter from Humana granting my appeal and putting my anti-rejection meds under Part B where they said they would be processed originally. It also said they had to re-work the claims and then issue a refund to me for my overpayments. It amounted to almost $1000. I called the appeals representative the next week to find out how long this would take, because I now had a monstrous credit card bill to pay because of their screw-up. Finally, nearly three weeks later, she returned the call and said it would take 4-6 weeks to get everything cleared up. So, I'm thinking that by the end of January 2009, it should be settled. Man, was I wrong. January came and went. Then February - then March - then April - then May, June, and July. Finally, in late August of 2009, my overpayment was refunded. It didn't take 4-6 weeks - it took almost 8 months (32 weeks) !! During this time, I'm called the Humana rep at least every two weeks and sometimes every week. I either got no answers or had to wait a week for a return phone telling me that they don't know when it's gonna be finalized. I was considering a lawsuit. How long do you think they would have waited to stop my benefits if I hadn't paid my premiums ?? Heck, they would have stopped them quicker than a Democrat can vote "yea" on a tax increase. But, I had to wait for what they owed me. Typical government bureacracy. After I got my refund, it still wasn't over. I had to get new "prior authorization" done by my doctor to get the anti-rejection meds paid for even though I was told the previous ones were good "indefinitely." I learned that "indefinitely" in socialized medicine speak could mean anywhere from a day, to a week, to a year. Basically, it's until they change their mind. Whereas, anyone with common sense knows for that for a transplant patient it means for the rest of your life. You can't stop taking your meds or you'll die. Then, in November 2009, I get a phone call from Humana at 7:30 one morning telling me that effective January 1, 2010 my anti-rejection meds are gonna be switched back to Medicare Part D from Part B. All the time spent getting the mess fixed was for naught. They were screwing it up again !! Once again, Humana told me they were gonna cover them one way and then said, "No. Sorry. We've decided to do it this way." They've done me that way on doctor's visits, too. I'm sick of it. I've been told that many people on Medicare love it and that everyone doesn't have experiences like mine. That is probably true, but let's think about something. We Americans like everything fast. We want fast food, cars, internet, and don't want to wait on service. Depending on who you listen to, there are currently anywhere from 20-40 million Americans without health insurance. So, let's say that ObamCare is passed and to be conservative, let's go with 20 million uninsured that will all join the ObamaCare rolls. Also, let's say 5% of them have a bad customer service experience like me. That's 1 million hacked off Americans. Furthermore, let's say the pessimistic pundits are right and that the plan is to eventually get ALL Americans on government run health care. That's over 300 million people. What if 5% of them have a bad experience. Know how many people that is ? Try 15 million !! If 15 million Americans, who want everything fast get the same kind of lousy customer service from ObamaCare that I have received from Medicare, can you imagine the riots and the weeping, waling , and gnashing of teeth ? It will be ugly. If the politicians in D.C. think people are pissed now, they ain't seen nothing yet. I know very well that our health care system in the U.S. is not perfect but it's the best in the world. Too many people, including me, with pre-existing conditions are discriminated against daily trying to purchase health insurance. Private insurance companies will NOT sell us a policy and that's wrong. So, how do we fix it ?? The only way to end this is to update our anti-discrimination laws to prohibit insurance companies from discriminating against people with pre-existing conditions. Insurance companies would then be required to sell a policy to anyone who wants it and can pay for it. However, if that's done they will simply charge enormous premiums that we can't afford to cover their increased costs. To fix that, the law would also need to set a cap on the premiums the insurance companies can charge or require that everyone be charged the same amount. As someone who believes in free enterprise, I've got a problem with this solution because healthy people would get charged the same as the sick or more than they should to make up for the extra costs incurred because of the sick. That's not fair either. Plus, we'd be forcing a unconstitutional government mandate on privately owned insurance companies. So, the question is - what'll we do ?? We're in a catch-22 because neither of these is gonna fly in a free country and to be honest with you - they probably shouldn't. Two quick things and I'm done. One - if you do NOT want to have this kind of lousy customer service experience with your health care in the future, you better take the time to contact your Senators (click here) and tell them that today. Two - next week there will be no politics on the blog. In honor of our Savior's, Jesus Christ, birthday, they'll be a couple of "Christmassy" posts, but that's all. It occurred to me last week that CBS had not aired Three Rivers, the drama about life at a Pittsburgh transplant hospital, in 3 or 4 weeks. So, I did what any good blogger would do - I went surfing ... on the internet. According to an article on TVGuide.com on November 30th (read it here), the show has basically been cancelled. CBS plans to complete production on the remainder of the first 13 episodes, the first season, but has not decided if or when they will air. I believe that CBS could have done an overall better job with the show. One thing that has been consistently done well, however, is CBS' portrayal of how the doctors, nurses, and other medical staff at Three Rivers care deeply for the patients there. It doesn't matter if the patient is poor as dirt, filthy rich, white, black, or whatever. Each one is treated as if they are the most important patient because the staff does whatever it takes to save each one. For that, CBS is to be commended. I loved that aspect of the show. However, the major thing I did not like in the last couple of episodes that aired was the soap opera feel. CBS began to dabble in relationship issues, social issues, and other matters that were not relevant to transplant. I've talked to other regular viewers who felt that CBS had to bring those things in because it was TV and they had to keep it interesting. I don't agree as I felt the goal needed to be the positive promotion of organ donation. But, that's the great thing about America, we have the freedom to agree to disagree. Maybe in the future, a transplant drama will get another shot. We'll pray that if that happens, it'll be a more successful show. Today, we'll wrap up this "Czar-castic" series with a brief look at one more of Obama's czars - Kevin Jennings, Safe Schools Czar. His official title is Assistant Deputy Secretary Office of Safe and Drug Free Schools and he reports to the Secretary of Education, Arne Duncan. However, some will argue that his title of Safe Schools Czar is a bit of an oxymoron considering his record. He wrote the foreword to Queering Elementary Education which advocates teaching tolerance of homosexuality to elementary school children. He founded the Gay, Lesbian, and Straight Education Network (GLSEN) whose mission is to empower gay youth in the schools. The GLSEN has a book list of recommended reading for kids. According to reports, many of the books contain explicit pictures and encourage child-adult sexual relationships. One of my goals for this blog has been to keep it family friendly. Therefore, I have not shared everything "controversial" that I have found concerning Jennings. However, if you want to know more, I would encourage you to Google him, but I must warn you that much of it will be shocking and offensive. The big question I have after seeing some of the stuff about the GLSEN is why do they think this stuff has to be taught to children ?? Can't we allow kids to be kids and enjoy the innocence of childhood ?? I also have the same question of Jennings that I did for the five other radical czars we discussed - why is this man a "special advisor" to Obama ?? Is the GLSEN curriculum what Obama wants American children learning in the future ?? If so, why ?? It's not gonna help them read, write or get a good job. Maybe we should spend some extra time and money teaching them how to read and write. How about we teach more American history instead of having the kids read the GLSEN book list. Then, maybe at least some of them will know and understand the values this country was founded on. Maybe then, some of them can help get this country back on track because it's becoming more and more obvious to me everyday that many of us have forgotten where we came from and where we should be going. To quote Bobby Bowden - "it's a dad-gum shame." God help us all. Our czar for the day is Ms. Socialist a.k.a. Carol Browner, Energy and Environment Czar. Her "official" title is Director of White House Office of Energy and Climate Change Policy. 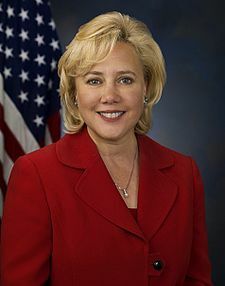 In the Clinton Adminstration she ran the Environmental Protection Agency (EPA) and her current duties are to coordinate energy and climate policy by emphasizing conservation and regulation. Up until a few weeks before Obama's inauguration, her name was listed on the website of the Socialist International as one of the leaders of it's Commission for a Sustainable Society. The group has been extremely critical of many U.S. policies. Surprise, surprise. I wonder if they were one of the sponsors of Obama's Apology Tour. The group supports a global government and says that wealthy nations need to shrink their economies to reduce global warming. I believe this is what is meant by "re-distribution of wealth." She served on the board of the Alliance for Climate Protection that was founded by Al "I created the Internet" Gore. News reports in recent days say that the science behind global warming may have been doctored and fraudulent. If it proves fraudulent, it would make Al Gore the biggest con-man in history. Check out this Fox News video on Browner. There has been some other controversey surrounding her, too. She has advocated for the government being able to regulate what homes and businesses set their thermostats on. In other words, if you like to set your home on 70 degrees in the summer, the government could mandate that it cannot be set any lower than 80 to "save energy." Plus, during negotiations with the auto industry concerning auto emissions levels, she instructed them "... to put nothing in writing." Sounds like somone had something to hide. The question is what ?? Just like with the other czars, I ask, what is this person doing in the White House shaping policy ?? The Obama Adminstration continually denies they are surrounding themselves with and trying to implement socialist and marxist policies. However, the evidence is beginning to prove otherwise. Tomorrow, we'll take our last detailed look at an Obama czar. His name is Kevin Jennings, Safe Schools Czar. His title is a complete oxymoron. You'll be disgusted when you find out why tomorrow. has praised Hugo Chavez for his "... incredible revolution ..." in Venezuela and even referred to it as "... a democratic revolution." More than 200 radio stations that disagreed with Chavez's policies had their braodcast licenses pulled. said in his book "Prologue to a Farce" (2006) that Thomas Jefferson's famous quote that "... a government is best which governs least" is "outdated." would like to charge privately owned radio stations large fees and give them to public radio stations to increase competition. He would target conservative radio talk shows such as Sean Hannity, Rush Limbaugh, and Glen Beck with these "fees." Guess which public radio stations the fees would be given to ?? Yep. You guessed it. The liberal ones. has cited radical socialist organizer Saul Alinsky as his inspiration. believes media can be used for social justice and change. I'll ask the same question again - why is this man a "special advisor" in the Obama Administration ?? I think there's only one answer - either Obama or other powers that be in the administration agree with him and want to see these policies enacted. We're down to two more czars to highlight. Up next - Ms. Socialism - Carol Browner, Energy and Environment Czar. Welcome to Dr. Frankenstein Day !! Today we'll highlight John Holdren, Science and Technology Car. His official job title is Assistant to Barack Obama for Science and Technology, Director of the White house Office of Science and Technology Policy, and Co-Chair of the President's Council of Advisors on Science and Technology. Whew .... that was a mouthful. strongly supports the theory of global warming. Unfortunately for him, he has been named in ClimateGate and the science behind the entire theory is slowly unraveling as being fraudulent (more about that in a future post). predicted that global warming would cause the deaths of 1 billion people by 2020.
said the government could take babies from "undesirables." Basically, a form of eugenics. The question is - who does he considerable an undesirable ?? The ill ?? The elderly ?? Is it based on race ?? co-authored 1977's Ecoscience : Population, Resources, and Environment, which says that in order to control population, a government may instititute "... population control laws, even including laws requiring compulsory abortion, could be sustained under the existing Constitution." It also mentioned other population control measures including mass sterilization by putting sterilants in drinking water and by implanting sterilization capsules in people once they reach puberty. Remember in yesterday's post I told you the U.S. Senate actually confirmed the nutty Cass Sunstein ?? Well, they also confirmed Holdren. The news is worse in his case, though. He was unanimously confirmed. Yes, you read that correctly. EVERY SINGLE MEMBER OF THE U.S. SENATE VOTED IN FAVOR OF HIS CONFIRMATION !! This includes Tennessee's Senators, Lamar Alexander and Bob Corker. None of them voted NO !! We, the American voter, need to give every single one of them a pink slip when they come up for re-election because they are in dereliction of duty. They should never have allowed him to have the power he now has. It's dispicable. Up tomorrow is the "Czar-castic" Mark Lloyd, FCC Diversity Czar. Today's highlighted czar is the looney Cass Sunstein, Regulatory Czar. His official title is Administrator of the White House Office of Information and Regulatory Affairs and it is believed that he will be responsible for "tweaking" legislation to aid the Obama Administration in doing things it cannot get done through Congress. Now, before I go any further and tell you about Sunstein's background, I have to issue a warning. IF YOU ARE ON BLOOD PRESSURE MEDS, MAKE SURE YOU HAVE TAKEN THEM BEFORE YOU READ ANY FARTHER. Your blood pressure is gonna "necessarily skyrocket" like electricity rates under Comrade Obama's cap and tax plan a.k.a. cap and trade. 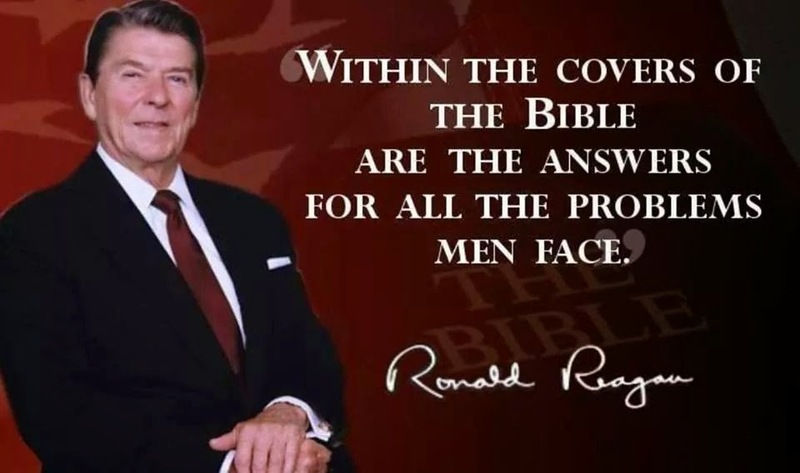 He believes the U.S. government should abolish the sanctioning of marriage. In his book, Republic.com (2002), he mentioned that freedom of choice on the internet is a bad thing because it allows people to seek out only people that share their same views. He says the government should require websites to link to opposing views. In his book, Animal Rights (2004), he stated that animals should be able to sue and get judgments against humans. He has called for a ban on hunting. He believes we should stop using animals for food "... because it is morally akin to slavery and the mass extermination of human beings" (Sunstein in 2007 at Harvard University). He does NOT believe private citizens should be allowed to own firearms. He believes some animals are more valuable than infant humans. Shocked ?? Find this hard to believe ?? Watch the two videos below to hear some of these things straight from this loon's mouth. Anyone ever hit a deer ?? How bad were you injured and your car torn up ?? Think about that and follow this nut's idiotic logic in these two videos for a moment. First, we have to ban hunting because it's cruel to animals and we should not be eating meat anyway. Guess what's gonna happen when we stop hunting and managing the deer herd ?? That's right. The deer will overpopulate leading to more of them being maimed or killed in deer-vehicle collisions. The deer will then be able to hire a lawyer and sue you for negligence and wrongful death. The fawns could sue you for negligence and wrongful death if you hit and kill their mother. Then, if we continue to follow the Liberals' logic, we the tax payers will just have to take care of the fawns for the rest of their lives because they are orphans. Or better yet, if you hit and kill a large buck, the doe can bring a suit against you for wrongful death and loss of consortium. Anyone besides me see how nutty this is ?? God help us. In confirmation proceedings before the U.S. Senate, Sunstein backtracked on what he previously said in the videos above. He claimed he is in favor of the right to keep and bear arms for hunting and didn't support animals being able to sue humans. Interesting. So which is it Cass ?? Could it be that he, like Bill Clinton and Comrade Obama, will say whatever is necessary to get support ?? Where does he actually stand on these issues ?? The saddest thing about the whole Cass Sunstein deal is that he was actually confirmed by the U.S. Senate in September by a vote of 57-40 (view roll call vote). Since there is no constitutional authority for czars, it should have never happened. However, the Senate could have ended this nut's moment in the sun once and for all by voting no but they chose not to. I'm glad I can say that both of Tennessee's Senators, Lamar Alexander and Bob Corker, voted against his confirmation. Up tomorrow is Dr. Frankenstein ..... oops, I mean John Holdren, Science and Technology Czar. Make sure you take your blood pressure medicine tomorrow, too. This guy's freakier than Sunstein. It'll be "Czar-castic" times 10 !! For more info on Cass Sunstein, visit http://stopsunstein.com/. Quick piece of housekeeping - there will be videos included with my blog entries the next several days. If you get my e-mail updates, it's very likely the videos will not come through in the e-mails. The quickest way to access the videos will be to click on the e-mail title which will direct you back to the blog page where you can view them. wrote an article in the fall of 2006 for the Democratic Socialists of America magazine which said " ... free markets and the joys of competition is nothing but pablum (def. from Webster's - soft cereal for infants) for the suckers." Hmmm. He thinks the free market is a joke and agrees with Mao that power comes from a gun. Is this socialist / communist really the guy we want overseeing the auto bailout and restructuring ?? Could it be that his appointment is nothing but a union payoff ?? Is this the best Obama can do when it comes to "special advisors ??" When I started this series, I picked out six of Obama's Czars to highlight. Tomorrow, we'll look at the second whose also one of the nuttiest - the "Czar-castic" Cass Sunstein, Regulatory Czar. What a "Czar-castic" list !! Two other czar positions are currently vacant - the Cyber Security Czar (formerly held by Melissa Hathaway) and the Green Jobs Czar (formerly held by Van Jones - please see my 9/8/2009 post for more about him). Rumor has it that these positions will be filled in the future and that Obama is considering even more czars. In fact, the Czar Organizer in Chief is considering appointing a Czar Czar. But .... isn't he already doing that job ?? Many of these czars job responsibilities could be performed by the Secretaries of State, Homeland Security, Interior, Defense, Treasury, Education, Labor, and Health and Human Services. So why is it necessary to pay these czars 6-figure salaries to do them ?? Could it be because if a cabinet position was doing these jobs they would be subject to congressional oversight ?? Begs the question - Mr. Obama, what are you hiding ?? Tomorrow, we'll start looking at some of the more radical czars and I'll show you some of what Obama's hiding. We'll start with the "Czar-castic" Ron Bloom who is the Manufacturing Czar formerly known as the Car Czar. In the meantime, I want to encourage you to do something - take the list I've provided here and Google some of the names. You will be shocked by some of the things you find. "The biggest problems that we're facing right now have to do with George Bush trying to bring more and more power into the executive branch and not go through Congress at all. And that's what I intend to reverse when I'm President of the United States." Hmmm. Interesting. By now, I'm sure most have heard at least a little of the controversy concerning the more than three dozen "Czars" that Mr. Obama has appointed since his inauguration. Normally, the term "czar" is thought of negatively as people normally think of Russia. The White House claims that Obama has no Czars but many "special advisors." That's interesting considering that Obama himself referred to Gil Kerlikowske, whose official title is Director of the Office of National Drug Control Policy, as "... the drug czar." most of them draw six-figure salaries costing us, the taxpayers, at least $4 Million this year. I'm sure any Obamanites that might be reading this are already crying, "But, but, but .... George W. Bush had czars, too !" And they would be correct. Bush, Clinton, and other past administrations have had czars. However, do you remember the quote above from the Czar Organizer in Chief where he said he was gonna end the executive branch power grab ?? Guess what - he hasn't done it. In fact, he has expanded it more than Bush or any other president ever thought about. Plus, he has appointed radicals to many of these positions. I'll tell you about them later in the week. The fact is Obama could have put an end to the "Czar-casm" but he has chosen not to. Myself and many others have got a major problem with that. Tomorrow, I'll provide you with the exhaustive "Czar-castic" list. Last week Mr. Obama held a jobs summit at the White House. In attendance were union bosses, corporate CEO's, and various elected officials. The purpose was to develop ways to create jobs and get the millions of Americans making up the 10% unemployment rate back to work. However, one important group was missing - the U.S. Chamber of Commerce. It is an association of thousands of small businesses all across the country. Small businesses create more than 70% of all new jobs in the U.S. However, Mr. Obama either didn't think it was important for them to be there or simply didn't want them there. It appears that it was more a case of he didn't want them there. Why ?? Politics - plain and simple. The Chamber of Commerce has been very vocal in it's opposition to Obama's cap and trade legislation which in his own words will cause electric rates in the U.S. "to necessarily skyrocket." Furthermore, they have opposed ObamaCare. Their reasoning is because small businesses will be unable to afford the new taxes and government mandates included in both pieces of legislation. The Chamber's arguments and reasoning make perfect sense. Obama playing politics with American jobs does not. Apparently, politics is more important to Obama than the millions of American families in dire straits because of loss of work due to the recession. I saw a T-shirt the other day which said - "A recession is when you lose your job. Recovery is when Obama loses his." Amen. Enough said. P.S. Starting tomorrow and lasting the rest of the week this blog is gonna get extremely "Czar-castic." The conservatives out there are gonna love it. The Obamanites ain't. A few days ago (December 1st), I told you of the bribe that Sen. Landreiu (LA - D) received for her yea vote on pushing the Senate health care reform bill out to the Senate floor for debate. Others have received what we'll call "incentives" to vote yea, also. The only reason I'm not using the term "bribe" is because they are not public officials. Why would the AARP endorse legislation which could lead to health care rationing and the so-called "death panels" directly effecting seniors ?? Why would the AMA endorse legislation allowing Uncle Sam to mandate how they practice medicine ?? For both organizations, "it's all about the Benjamins" - money, and lots of it. In recent years, the AARP has become an insurance salesman by being a huge supplier of Medigap policies for seniors. Medigap policies pick up coverage where Medicare leaves off. If ObamaCare passes, huge cuts are in store for Medicare Advantage plans causing more seniors to need Medigap policies resulting in mega profits for the AARP. The AMA was scheduled to receive a 21% cut in physician reimbursement rates starting next year, but Obama promised to eliminate the cut if they backed his bill. You don't have to be a rocket scientist to figure out what they decided. Others received similar "incentives." To read more, check out the entire Newsmax article (here). Basically the whole ObamaCare fiasco boils down to one thing - corruption. It's time we, the American voters, put a stop to it. We still have time as it is under debate in the Senate now. Contact (here) your Senators and tell them to vote "NO" on ObamaCare. The sheep (the American taxpayer, the uninsured, and the elderly) are everywhere. The wolves (Nancy Pelosi, Harry Reid, Barack Hussein Obama, Chris Dodd, and Tom Daschle) are among us, too. Myself and other sheepdogs need more of the sheep to join our pack as we try to put a stop to these Obam-inations. We need to heed the words of the 1986 rock anthem "We're Not Gonna Take It" by Twisted Sister by getting to the polls in droves next year and issue pink slips to each and every Senator and Congressperson that votes in favor of this legialstion. We do need to make some changes to our health care system to get more people access. However, the current piece of crap that's been proposed is not the way to do it. P.S. The AARP is already paying the price for stabbing seniors in the back. Over 60,000 of their members have told them "where to go" in the last few months by either resigning their memberships or not renewing. Good for them. If you're an AARP member, I'd encourage you to do the same because they have sold you out. P.P.S. Check back next week for a new special series. It's one I promised a few weeks ago and it's gonna be "Czar-castic." For my readers who have been visiting the blog and receiving my e-mails since day one, I have good news. Many of you have previously tried to leave comments after my posts but have received an error message saying ""Your request could not be processed. Please try again." Due to help from friends, the glitch that was causing the error message has been neutralized and the comment section is now working properly. So, feel free to leave many comments after future posts. Thanks again to everyone that regularly visits the blog. How much does a "yea" vote for ObamaCare cost ?? According to Fox News, it's $100 Million (click here to read article) or $300 Million (click to read article). That's what Senator Mary Landrieu (D - LA) (pictured left) received for her "yea" vote for opening up debate on ObamaCare in the Senate. The funds are supposedly additional funding for Louisiana's Medicaid program. However, until she locked down these millions, she was undecided and reportedly leaning toward "nay." Funny how she suddenly made up her mind when a multi-million dollar payout for her constituents became available. Sounds like she'll do anything to get re-elected. She did say, though, that just because she voted in favor of beginning debate, it doesn't mean she will definitely vote for passage of the final bill. That's like saying that just because you sit a beer in front of Joe Biden, it doesn't necessarily mean he'll definitely drink it. The incident just goes to show how corrupt Washington has become. If I remember right, offering a public official an "incentive" for voting a particular way is illegal. In fact, where I come from it would be called a BRIBE. Usually, a public official who accepts an "incentive" a.k.a. bribe, usually goes to jail. But, maybe the rules are different in D.C. I mean the Obama Administration has basically done whatever it wants to this point - i.e. appointing over 30 Czars (for which there is no Constitutional authority), taken over banks (for which there is no Constitutional authority), taken over car companies and fired their CEO's (for which there is no Constitutional authority), and completely ignored the bankruptcy law's rules of priority for creditors in the GM and Chrysler bankruptcies to payoff ... oops, I mean ... to make the UAW happy. So what's a little bribery ?? I mean, I'm just asking. 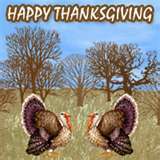 I just wanted to take a moment to wish everyone a Happy Thanksgiving. It dawned on me earlier today that this is the third "extra" Thanksgiving" the Lord has blessed me with since my transplant. It wasn't that long ago that I did not know how many more I would get to enjoy with friends and family. After you go through a chronic illness that nearly takes your life and come out on the other side doing great, you look at things a little differently. Each morning I'm thankful just to not to wake up dead. I'm thankful to be able to get out of bed, clean up, and get dressed under my own power and spend another day with my wife. I used to get frustrated when I'd go deer hunting or fishing and come home with nothing. Now, I'm thankful just to have the physical strength to to go. If a get a deer or catch a few fish, then that's just icing on the cake. Unfortunately, we humans tend to take things for granted until they are nearly taken from us. I want to encourage you today to enjoy the things you have, your family and friends, and be thankful for them. 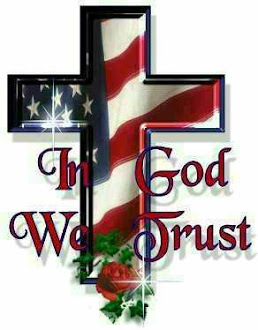 Say a prayer for our miltary families who are apart because a loved one is serving oversees. If you see someone in a military uniform, tell them how thankful you are for them and their service to our country. May God Bless you all. I did a post the other day about rumors of a possible Sarah Palin / Glenn Beck presidential ticket in 2012. I'm wondering if there could be more to this than just rumors. According to Newsmax (click here to read entire article), over the weekend Glenn Beck announced plans for a "major political organizing effort" that will focus on things such as conventions, seminars, political rallies, and voter registration drives. When Sarah Palin resigned as Alaska's governor, we were told it was to campaign for and recruit good conservative candidates. I'm beginning to wonder if their plans may be working together toward the same end ?? Could that "end" be a presidential run in 2012 ?? Think about it - Beck's organizing and Palin's recruiting is going to keep them in the news and talked about on the blogs for the near future and the Liberals just love to beat up and demonize both of them. Beck and Palin's organizing and recruiting coupled with all the press and demonization by the Libs could play right into their hands. Why ?? All of it will give Palin and Beck more and more name recognition and any incumbent politician or future candidate knows that is a good thing. It's gonna be fun to watch. ATTENTION Sarah Palin (upper right) and Glenn Beck (lower right) fans !! 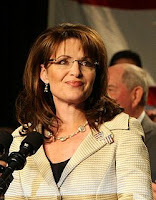 What would you say if I told you there was a possibility of a Sarah Palin and Glenn Beck presidential ticket in 2012 ?? Sound too far-fetched ?? Maybe not. According to an interview Sarah Palin did with NewsMax magazine (click here), the former Alaska governor and Vice-Presidential candidate has not ruled it out. This ticket would keep Obama and Biden on their toes. In 2008, they only had one attack dog, Palin, to deal with. This time they would have two. Poor Biden will need a "beer summit" every evening. I think this ticket would really make 2012 interesting. Think about it - hockey and hunting with M and M's and sneakers. Could it get any better than that ?? 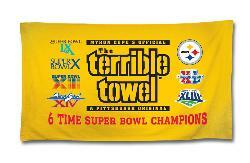 Now, the "towel incident" last December makes perfect sense. Bud Adams' flipping the Buffalo Bills and their fans the bird during the game on Sunday shows exactly where your organization's lack of common decency and respect for others comes from - straight from the top. No wonder Houston kicked you guys out. You have no class at all. The saddest thing is linebacker Stephen Tulloch's comment in The Tennessean concerning Adams actions - "... He is a cool owner and it is good to see him around here supporting us. To have an owner like that, it's cool" (http://www.tennessean.com/article/20091117/SPORTS01/911170339/Bud+Adams++gesture+draws++250+000+fine++apology). Tulloch's kidding right ?? It's cool ?? It's classless. No wonder you've never won the Super Bowl. Is this really the example that Nashville wants it's NFL team sitting for the local children ?? The $250,000 fine was too lenient. Thug fans should be ashamed and find a team with some class to pull for - period. Even the Baltimore Ravens have more class than you guys. But that's not saying much, is it ?? I have recently placed a link on this blog to a FREE NRA MEMBERSHIP. If you are not a member of The National Rifle Association but have thought about joining in the past, here is your chance to try it out ABSOLUTELY FREE !! Just click on the link in the lower part of this blog and follow the instructions and you'll be taken care off. Also, if you find my blog as a result of this offer, please leave a comment or send me an e-mail to let me know. I am trying to increase blog readership and would like to track the results to see if this helps. Thanks for your help and enjoy the blog. As a University of Tennessee alum and football fan, I was embarrassed and angry last week when learning that three players, Nu'Keese Richardson, Mike Edwards, and Janzen Jackson, had been arrested for attempted armed robbery. I often say that my blood runs "Big Orange." I had hoped that the off-field behavior problems which plaqued the team during the Fulmer Regime were over with the hiring of Lane Kiffin. Unfortunately, I was wrong. The last few years of Phil Fulmer's administration saw numerous players get into trouble with the law. Unfortunately, in most cases all Fulmer did was slap them on the wrist by suspending the guilty parties for a quarter or a half of a game. What a joke. His non-existent discipline measures ultimately led to his downfall. The lack of discipline off the football field led to no discipline on the field and was evidenced by numerous false start, holding, and personal foul penalties. Penalties which led to numerous losses to Florida, Georgia, Alabama, and Auburn. All of these elements compounded together ultimately cost him his job. In my opinion, it took UT too long to boot him. Until last week, I was extremely proud of the UT football program this year. When Fulmer left, many players jumped ship which left the team young and inexperienced. Kiffin, however, managed to pull the team together and they have fought and scrapped and been in every game they played this year up until Saturday. Plus, there had been no significant discipline problems. Heck, they took #1 Alabama down to the last play of the game before losing and only lost to Florida, who was ranked #1 at the time, by 10 in the Swamp. Unfortunately, the arrests of their teammates last week was a distraction and they were whipped by Mississippi 41-17. Anyone who plays football at UT must give 110% on the field and in the classroom. Anyone who plays football at UT must graduate. Set a curfew. Richardson, Edwards, and Jackson were allegedly at the scene of the crime at 1:43 a.m. on a weeknight. Why were they not in their dorm room ?? Anyone who plays football at UT must obey the law and act like a gentleman. Anyone who plays football at UT and fails to do #'s 1,2,3, and 4 is booted from the team - period. Plus, if someone who plays football at UT gets booted from the team, Coach needs to do everything in his power to keep them from playing in the NFL. These will not be popular. However, I believe it's high time we as a nation refuse to let people be thugs and criminals simply because they are athletes, politicians, or other so-called "important people." Morals, ethics, and the rule of law are still important whether the media and other bleeding hearts think so or not. This is the lesson that Coach Kiffin must teach the young men he coaches and his handling of this incident is his biggest test so far. The result is more important than beating Florida or Alabama or even winning a championship, and I'm praying he gets it right. I heard earlier today that Anita Dunn is resigning her position at the White House effective at the end of this month. This is the same Anita Dunn that claimed, "The reality of it is that Fox News often operates almost as either the research arm or the communications arm of the Republican Party." She went on to say that "... the way we (the White House) view it, is that it is more of a wing of the Republican Party." She made both these statements last month as part of the so-called White House "war on Fox News." These statements were spoken like someone who obviously doesn't have a clue what she is talking about. If you ever watch Fox News, you know that most of their opinion shows are admittedly more identifiable with the Independents and not the Republicans. Furthermore, this is the same Anita Dunn that was recorded saying that one of her favorite political philosophers is Mao Tse Tung - the Communist who had millions of his own people executed !! What the heck was this woman doing in the White House anyway ?? I'm sorry to have to inform everyone of the fact that the video I posted in yesterday's blog post has been removed from Youtube. If you have been trying to view it but cannot, I apologize. I've had a few people tell me that if you search Youtube you can still find it just not at the link I gave Friday. This 20/20 story done by John Stossel on socialized medicine was very informative, and I suspect that the ObamaCare supporters had it yanked. Censorship is alive and well in America. They've already ignored the 9th and 10th Amendments. Now its bye, bye freedom of the press and of speech. We will miss you. What's next ?? The 2nd Amendment ?? The 4th ?? God only knows. Congress will reportedly vote on health care reform a.k.a. socialized medicine a.k.a. universal health care a.k.a. ObamaCare as early as this weekend. Please watch this video from ABC's 20 / 20 and then if you feel as strongly as I do that ObamaCare is not the answer to reforming our health care system, then contact your Senators and Congressman immediately and tell them to vote "absolutely, positively no" on ObamaCare. The contact information for your Senators or Congressman can be found in the U.S. Senate and U.S. House of Representatives links on the right side of my blog page. It is rumored that ABC fired John Stossel for making this video. He now works for Fox. Also, if you get my e-mail updates, the video link will not come through in the e-mail. All you have to do to view the video is click on "ObamaCare equals NO CARE" in the e-mail title and you'll be directed to my blog where you can view the video.